Top 10 Coastal Ice Moderates, Part 1. Legendary Canadian Rockies climber Barry Blanchard recently published his list of the top 10 Rockies ice climbs WI4+ and easier. 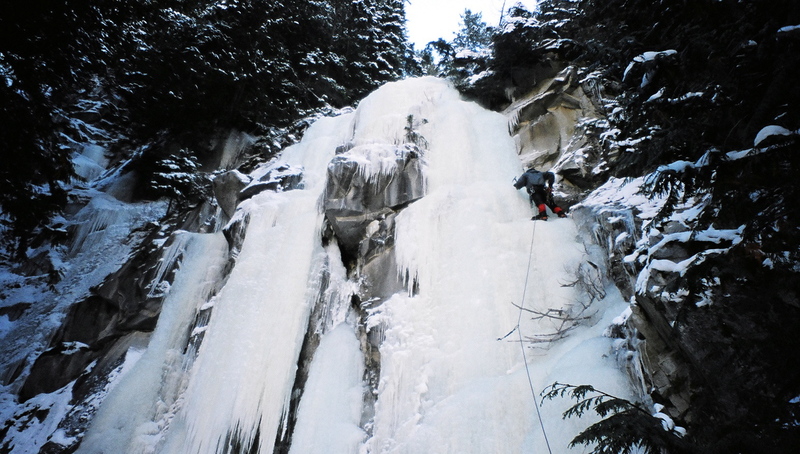 I’m a sucker for these sorts of lists (and also a decidedly moderate ice climber) so I thought I’d try to come up with something similar for South-West British Columbia. Like Barry’s list, my choices are highly subjective. However, whereas there are few people more qualified to write about Rockies ice climbing than Barry, there are few people less qualified to write about West Coast ice than myself (I’ve actually climbed a lot more ice in the Rockies than on the Coast). I’m posting this in two parts since there are a couple of routes that probably ought to be included but which I have yet to climb. 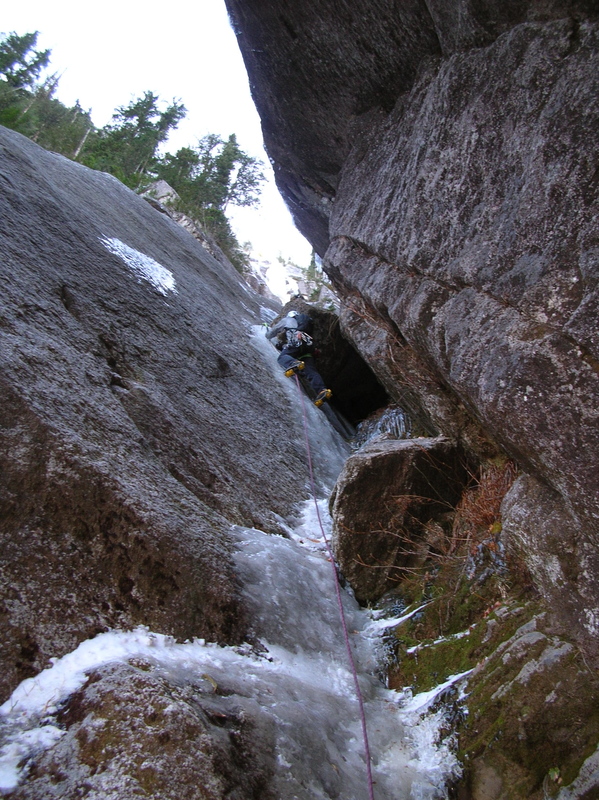 Hidden behind the Chief in a chasm splitting the large wall above Oleson Creek, A Scottish Tale seems to form with slightly more regularity than most of the ice climbs around Squamish. Unfortunately it’s a bit hard to scope; either hike to the north peak of the Chief or consider making a reconnaissance of the approach (many people seem to have a hard time finding the route). 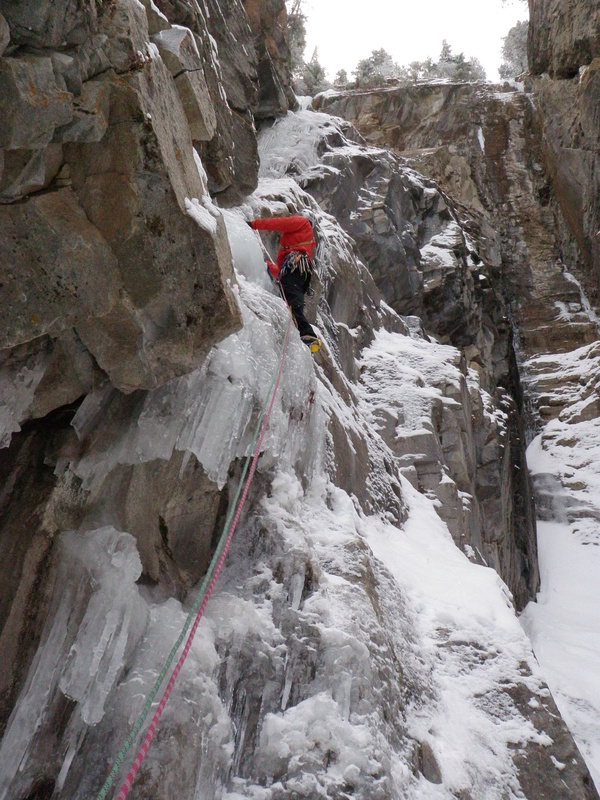 Rich So had only ever climbed a couple pitches of ice in his life before we climbed A Scottish Tale this past november. Luckily, he’s a natural climber and the ice was so thin that not knowing how to swing an ice tool may have actually been an advantage. The route is never steep but it’s very continuous with virtually no walking between pitches. When it’s thin, a small rock rack is useful (and the climbing may be pushing the upper end of what most people would consider “moderate”). Entropy is a prominent and appealing route plastered to the Soo Bluffs, halfway between Whistler and Pemberton. It’s similar in difficulty and appearance to the upper pitches of Cascade Falls near Banff although sadly it’s a bit farther from the road. 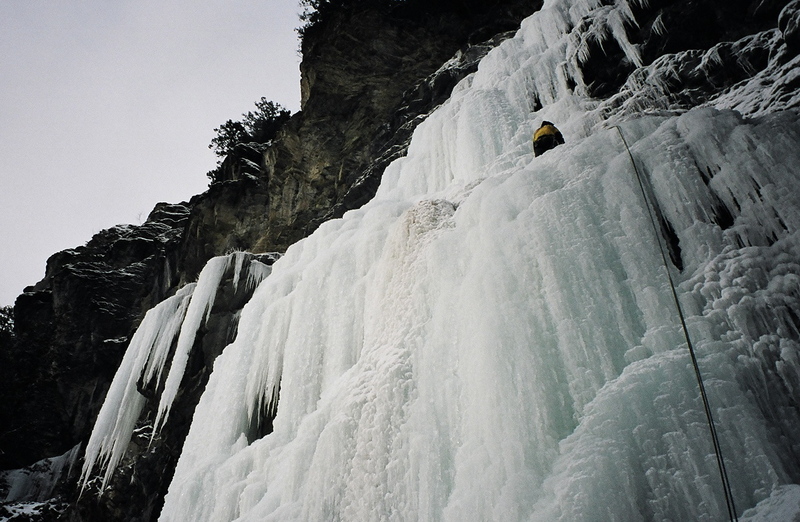 Wet ice generally makes for easy climbing but strenuous belaying as the ropes become coated in ice. Correspondingly, on the day that four of us climbed Entropy I recall belaying but I don’t remember much about the climbing. Paul, Magda, Sarah and I climbed the wide flow of ice as two parallel teams. It was nice to have company while forcing the frozen ropes through my belay device on a day that, although not truly miserable, was wet, cold and snowy enough to make me wonder what the hell I was doing there (as the name of this blog implies, it doesn’t take much). During the years that I was I going to school in the Vancouver, Stefan was living in his van, treeplanting and climbing all over North America. In the winter he’d be out in the Rockies and I used to occasionally skip a few classes and catch the overnight Greyhound to Canmore where we would bash our way up various classic ice routes. Times change, and now I’m the underemployed climbing bum (albeit with a philosophy degree) while Stefan has transformed into a remarkably diligent student. He’s far too responsible to skip classes, but this last december he had a few days free after his exams so we made a short trip to Lillooet. There weren’t exactly a plethora of routes in condition and after climbing the usual suspects (Icy BC and the Rambles), we decided to gamble on the glimpse of ice we could see on Closet Secrets. At the base, it was clear that a previous party had backed off (had I known at the time that it was a very well respected local climber I probably would have done the same thing) but, encouraged by a couple of pitons that Stefan was smart enough to keep stashed in the bottom of his ice climbing pack, I sketched my way through the thin and delaminating ice. On the second pitch, I climbed into a chimney between the ice and rock which provided some very unique but awkward climbing. Don Serl writes in West Coast Ice that Closet Secrets is an “exciting climb … in awe inspiring surroundings” and I wholeheartedly agree. Starting the first pitch of Closet Secrets in deceptively thin conditions. Photo: Stefan Albrecher. That Alanna Theoret ever became an ice climber is a testament to her remarkable toughness (although some might see it as evidence that she has either a poor memory or sense of self-preservation). 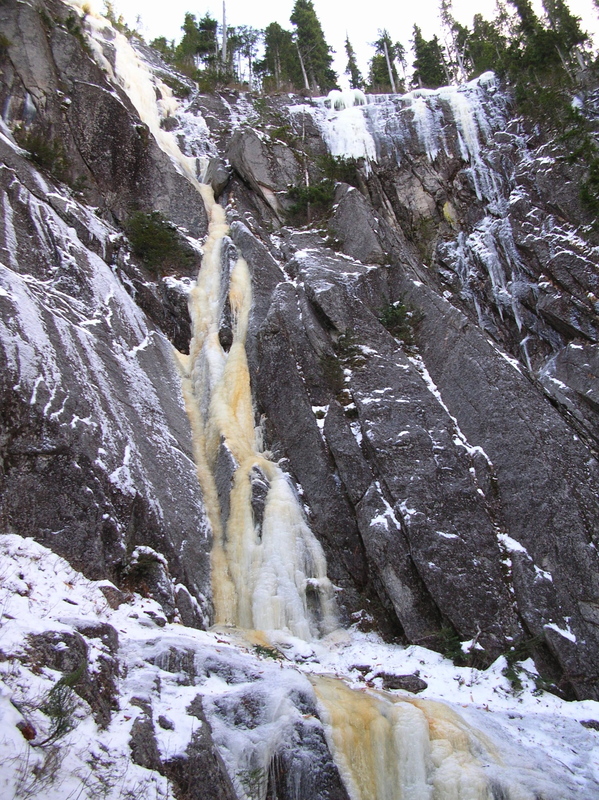 Her first ice climbing experience was during a balmy spring day on Vancouver Island. 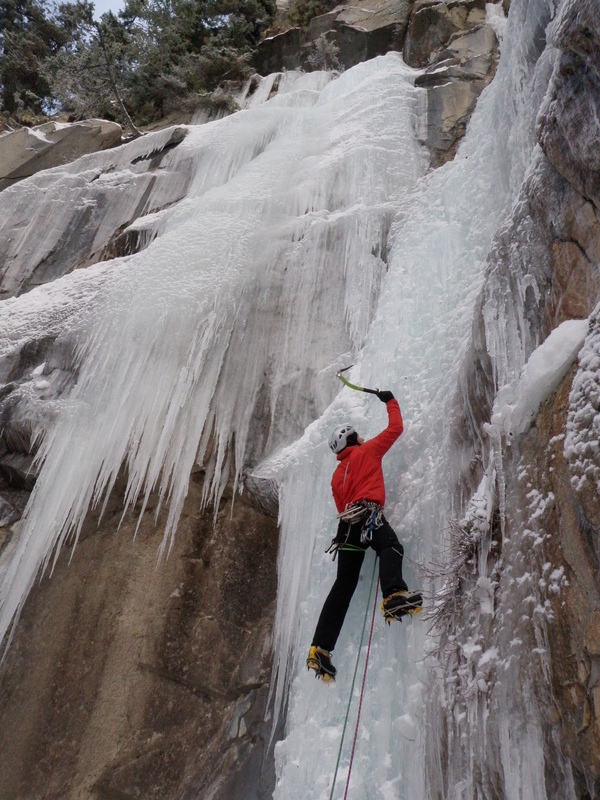 While leading the second pitch of the route, her partner fell and ripped out a number of screws from the slushy ice. As he fell past her, he gashed her leg with his crampons and his impact onto the anchor ripped out everything except for a v-thread. The climb was reasonably remote and it also happened to be one of Alanna’s first times on skis; in short, the whole ordeal would have been enough to deter most people from ice climbing ever again. Thankfully Alanna is not easily deterred from anything and in January of 2005 we left Campbell River for a short road trip to Lillooet. The final route of our trip was Rambles Centre which is a lovely, and deservedly popular route. It’s the most self-contained of the Rambles but still gives you the option of numerous lines on the upper tier. The right side of the Upper Tier of Rambles Centre. Photo: Alanna Theoret. There's also excellent climbing elsewhere in the Rambles. This is the Peterson-Smaridge Dihedral which on this day was formed to the top of the wall. Photo: Stefan Albrecher. Great things can be accomplished by climbing partnerships that are based on mutual, but completely unfounded confidence in the abilities of the other person. Years later while discussing this route, Stefan told me: “It was one of my first ice climbs, but I assumed that you knew what you were doing.” Perhaps disturbingly, I had been assuming the same thing about him. From this inauspicious start, we went on to climb together extensively including two expeditions to Alaska and a trip to Europe. Synchronicity would be a classic moderate ice route anywhere. It’s prominent, appealing, long, and sustained without ever being particularly difficult. 2 Responses to Top 10 Coastal Ice Moderates, Part 1. Great routes….verrrry goooood pictures…..good collection!! I’ll ‘bookmark your site….great stuff…keep up the good work!! Good stuff – makes me want to head back to Vancouver for a bit!